Whichever category a team or driver is competing in, pre-season testing is a vital exercise. Not only does it allow the squad of mechanics and technicians to gel with their pilot as a cohesive unit, it’s an opportunity to nurture their respective talents where it really matters – on the track. For years, juggernauts have transported cars and kit to sunnier Iberian climes, leaving Britain to grind to a standstill as an inch of snow fosters national panic. But with Estoril and Barcelona now done, the GP3 show has moved to Silverstone for the final two days of action. Stood behind the impressive Silverstone Wing pits complex listening to the rasping echo of the new generation of GP3 cars’ Renault engines reverberating around the empty grandstands is enough to make your skin goosepimply. Today they were aided and abetted by perishing winds and light flurries of snow. Whilst I made a futile attempt to get warm using the radiating power of a latte from the media centre, Josh Webster emerged from the Status Grand Prix truck and bounded over, arm outstretched. Racing drivers come across on television as confident young men and women and Josh was no different. But there was no arrogance about his demeanour, rather a bristling energy and infectious enthusiasm. Josh’s name may not be one that is immediately familiar with the general public but make no mistake – he is a future star of Formula 1 and is name will trip off the tongue as easily as that of Hamilton’s and Button’s. 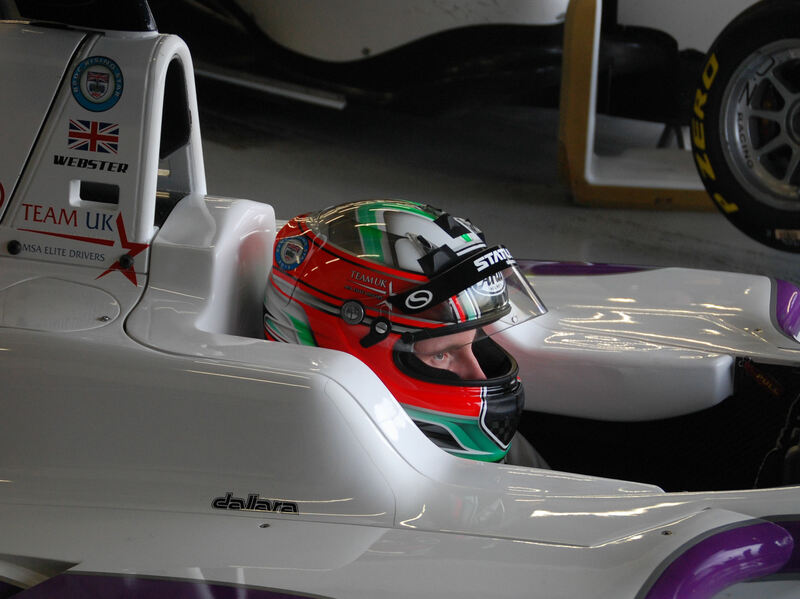 Race suit already donned, Josh quickly got his balaclava, helmet and gloves on before disappearing behind a screen to be strapped into the new-for-2013 Dallara GP3/13 chassis, distinctive in Status GP’s white and purple livery. Josh imagines the lap of Silverstone as he prepares for the final run of the day. Belts tightened, steering wheel attached, 450 racehorses charge into life and within seconds the only evidence remaining of Josh’s presence in the garage is a pair of black rubber lines left by his Pirellis. Josh’s car #19 has barely disappeared from view when I was collected from the pits by his mum Pam, who whisked me over to the British Racing Drivers’ Club House near the Silverstone Complex by the old pit entrance. The Webster family, Josh’s dad and sister Fern were also present, were entertaining a number of corporate guests in the BRDC building, seeing where their sponsorship and investment had got Josh so far. Talking to Pam and Fern, it was clear that this was a dedicated, supportive family backing their son and brother every step of the way towards his F1 goal. Pam confirms how intrinsic the Webster family is to Josh’s career. By the time we’ve returned to the parking lot behind the pits, the official test is over and Fern collects Josh, now in his civvies, from the Status Grand Prix truck. It’s immediately clear how much the support of his family means to Josh as he embraces them and says his goodbyes as they prepare to leave the circuit. I suggest to him that such family-centric scenes in motor racing hark back to an era of a few decades ago, rather than the corporate cut and thrust of today. He sees immediately what I’m angling at. “Does it add any specific pressures?” I query. It’s easy as a casual, occasional observer to assume everything in the upper echelons of motor racing is gilt-edged and dripping with wealth but Josh’s a refreshing reminder that whilst that’s the case for a few, it’s not a universal truth. Being grounded and having the common touch will no doubt resonate with Formula 1 fans when a seat at motor sport’s top table becomes available. But that’s for the future and 2013’s focus is GP3. How does a driver like Josh, who’s enjoyed a meteoric rise through junior formulae manage his expectations for the season ahead? 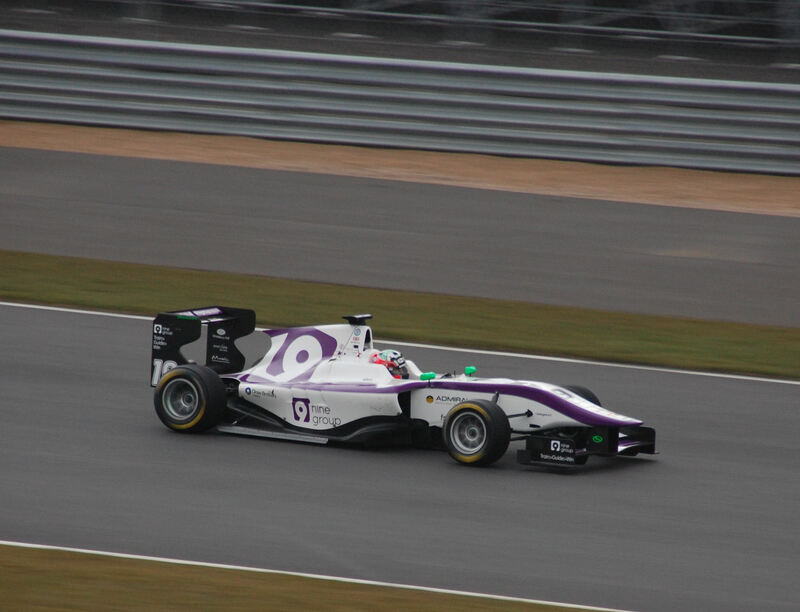 Although Josh’s plan is to spend a couple of seasons in GP3, he allows himself to acknowledge that a strong season could open doors to GP2 and F1 earlier than envisaged. When I suggest a couple of stellar campaigns could see him lining up in Melbourne alongside Alonso, Hamilton and Vettel in 2015, a smile opens up as he nods. It’s not the gloating grin of a young man swaggering about the pitlane though, but a moment of realisation of how close his talent and family’s support has brought him. “(Laughs) I’m sure they’ll all be too busy to be watching me,” he jokes self-deprecatingly. “No, you’re conscious it’s a bigger stage, with a bigger audience and more TV work but it’s a great setting in which to learn as the more successful you are the more there is to do. “Knowing there’s so many people watching keeps you focused, certainly. Yes, your mistakes are visible for everyone to see, but equally how you deal with them and how you fight to win are also on full display. As we sit in the back of the garage, hard worked engines and gearboxes clink a symphony of heat dissipation chimes, interrupted by the heavier thud of crates being lugged back to the truck; the remaining wafts of rubber and petrol laced air drift away in the wintry breeze. I quiz Josh on what the biggest challenges are adapting to GP3 after years in Formula Renault. “I’m going to sound like everyone else, but downforce is the biggest difference. These new cars are much more powerful too, up from 280 to 450 horsepower but they now look and sound like proper racing cars, which is great when the family are showing sponsors around. “(With a wide grin across his face) Well, it’ll certainly make it more interesting on the first corner of Barcelona when all these inexperienced drivers go piling in with skinny little wings, won’t it? “And which circuit are you hoping to exploit that particular skill at most? The prospect at racing at which track is giving you the most excitement?” I ask. His response is immediate and without hesitation. The response of a young gun trying to sound heroic and big ballsed? Not at all, the glint in his eye and his body language adjusting as he gripped an imaginary steering wheel as though threading his Dallara through Eau Rouge’s ribbon of asphalt, tells a different story. This is a driver whose talent on track will talk much more loudly than anything he could say verbally. 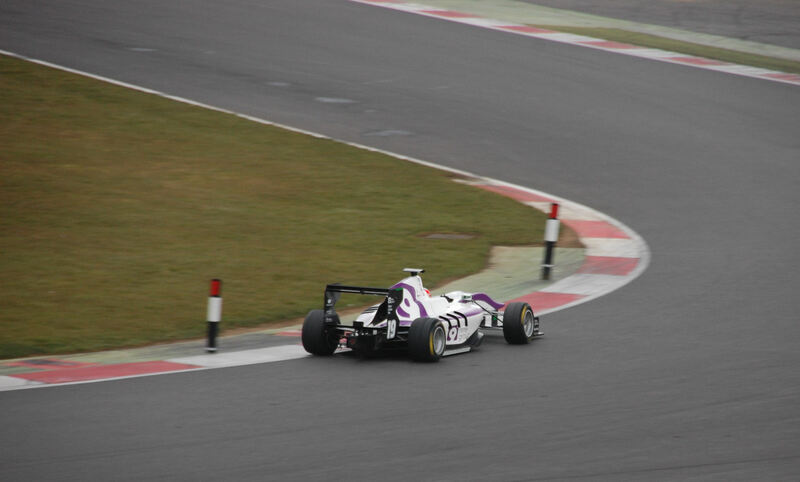 Josh Webster is hoping this will be the view his GP3 rivals have of his car for much of the 2013 season. Conscious of the ever duskier colour of the sky, I decide to call it a day. Josh’s got a little more debriefing to do at the circuit before a busy following day back at base poring over data and settling back behind the wheel of the simulator. As the chatter draws to a close I wonder whether Josh’s gone the route of many successful drivers and has a bit of a superstitious routine following an early success. “Early on in my career I was wearing some Alpine Stars racing gloves and under the logo of the glove, if you peel it back there’s a little label that says ‘win’ on it. At the race I discovered it, I remember thinking ‘this is what I’m here for’ and sure enough, I won! Whichever year Josh Webster does makes his Formula 1 debut, I’m confident he’ll still read those labels on his gloves as he races towards the top step of the podium. Follow Josh’s GP3 season on Twitter as well as his official website.